Marriage license mystery on my hands . . . 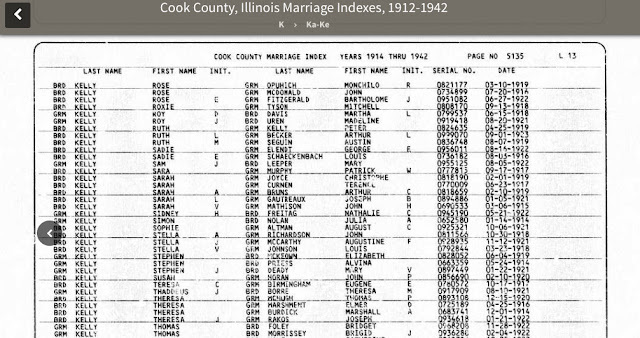 Looking at the Chicago Tribune for June 17, 1890, p. 2 at Footnote.com I find that a marriage license was issued to Samuel Prince and Rachel Provolsky, but I don’t see their names in the Illinois Statewide Marriage Index and I need the license number to be able to find the license on microfilm. Fortunately, the lists that appeared in the newspapers were arranged in license number order and so it’s not hard to deduce the license number based on index entries for the surrounding names. The following chart shows what I found using the online index. Based on this, the license number for Samuel should be #153869 and I find an entry in the hand-written marriage index books (on microfilm) which confirm this. However, when I look at the marriage license film, #153869 is not a license for Samuel and Rachel. It’s for James Gething and Bertha Bonk and their names appear in the online index. 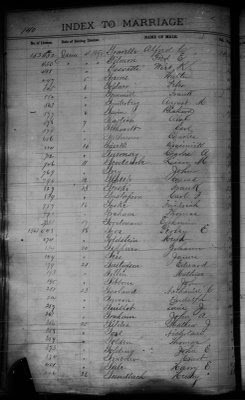 But, based on a quick quick check of the hand-written marriage index books James Gething’s name doesn’t seem to be there. The marriage license numbers weren’t reused during this time period and so there should be only one record for any particular number. I’m thinking I could scroll through the license film to see if the record for Samuel is misnumbered but I think there’s more to this search than that. Something out of the ordinary is up, but what? I wish I had quick access to the marriage license applications to see if James Gething’s name appeared there, but I don’t. I’d love to hear your suggestions for how to proceed. Maybe the mystery will solve itself when these records go online at FamilySearch's Record Search pilot. UPDATE: Quick update: License 153386 is for Frank Herle and Eva Greiner with a date of June 4. One possibility is that the license number was written wrong on the license and thus "misfiled" according to that incorrect number but I didn't see the Prince license scrolling through the 153800s and because I think my chances of find the license are getting smaller and smaller I have to stop somewhere. I think it's time to wait and see if the license appears on FamilySearch's Record Search pilot . . .